Salinity is the term used to define the total content of dissolved salts in sea water. It is calculated as the amount of salt (in gm) dissolved in 1,000 gm (1 kg) of seawater. It is usually expressed as parts per thousand or ppt. Salinity of 24.7 (24.7 o/oo) has been considered as the upper limit to demarcate ‘brackish water’. Salinity determines compressibility, thermal expansion, temperature, density, absorption of insolation, evaporation and humidity. It also influences the composition and movement of the sea: water and the distribution of fish and other marine resources. The salinity of water in the surface layer of oceans depend mainly on evaporation and precipitation. Surface salinity is greatly influenced in coastal regions by the fresh water flow from rivers, and in polar regions by the processes of freezing and thawing of ice. Wind, also influences salinity of an area by transferring water to other areas. 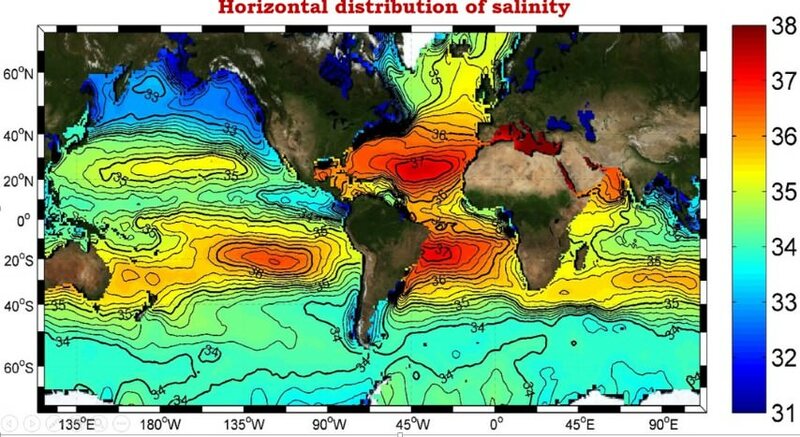 The ocean currents contribute to the salinity variations. 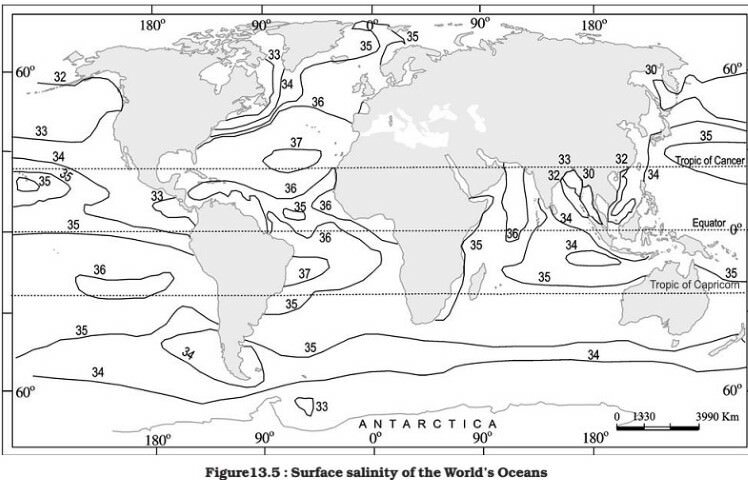 The salinity for normal open ocean ranges between 33 and 37. In the land locked Red Sea (don’t confuse this to Dead Sea which has much greater salinity), it is as high as 41. In hot and dry regions, where evaporation is high, the salinity sometimes reaches to 70. In the estuaries (enclosed mouth of a river where fresh and saline water get mixed) and the Arctic, the salinity fluctuates from 0 – 35, seasonally (fresh water coming from ice caps). The average salinity of the Atlantic Ocean is around 36-37. The equatorial region of the Atlantic Ocean has a salinity of about 35. Near the equator, there is heavy rainfall, high relative humidity, cloudiness and calm air of the doldrums. The polar areas experience very little evaporation and receive large amounts of fresh water from the melting of ice. This leads to low levels of salinity, ranging between 20 and 32. Maximum salinity (37) is observed between 20° N and 30° N and 20° W – 60° W. It gradually decreases towards the north. The average salinity of the Indian Ocean is 35. On the contrary, the Arabian Sea shows higher salinity due to high evaporation and low influx of fresh water. The North Sea, in spite of its location in higher latitudes, records higher salinity due to more saline water brought by the North Atlantic Drift. Baltic Sea records low salinity due to influx of river waters in large quantity. The Mediterranean Sea records higher salinity due to high evaporation. 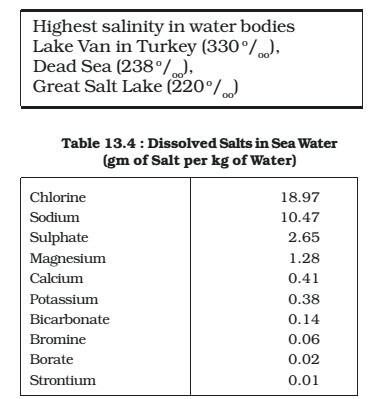 Salinity is, however, very low in Black Sea due to enormous fresh water influx by rivers. The salinity of the inland Seas and lakes is very high because of the regular supply of salt by ‘ the rivers falling into them. Their water becomes progressively more saline due to evaporation. For instance, the salinity of the Great Salt Lake , (Utah, USA), the Dead Sea and the Lake Van in Turkey is 220, 240 and 330 respectively. The oceans and salt lakes are becoming more salty as time goes on because the rivers dump more salt into them, while fresh water is lost due to evaporation. Salinity decreases from 35 – 31 on the western parts of the northern hemisphere because of the influx of melted water from the Arctic region. With depth, the salinity also varies, but this variation again is subject to latitudinal difference. The decrease is also influenced by cold and warm currents. In high latitudes, salinity increases with depth. In the middle latitudes, it increases up to 35 metres and then it decreases. At the equator, surface salinity is lower. Salinity changes with depth, but the way it changes depends upon the location of the sea. Salinity at the surface increases by the loss of water to ice or evaporation, or decreased by the input of fresh waters, such as from the rivers. Salinity at depth is very much fixed, because there is no way that water is ‘lost’, or the salt is ‘added.’ There is a marked difference in the salinity between the surface zones and the deep zones of the oceans. The lower salinity water rests above the higher salinity dense water. Salinity, generally, increases with depth and there is a distinct zone called the halocline (compare this with thermocline), where salinity increases sharply. Other factors being constant, increasing salinity of seawater causes its density to increase. High salinity seawater, generally, sinks below the lower salinity water. This leads to stratification by salinity.